A House of Commons committee claims arms made in Britain may have been fired on civilians during Tamil Tigers battles in Sri Lanka. In their annual report, the cross-party committees on arms export controls recommended the government should review all arms exports to Sri Lanka following the crackdown on rebels. The MPs also questioned the government's commitment to tackling corruption and bribery and called on ministers to investigate what British-supplied military equipment was used in the campaign against the Tamils. The UK exported a "wide variety of military equipment and weapons" to Sri Lanka in the period following a fragile truce agreed between the government and the Tamil Tigers in 2002. 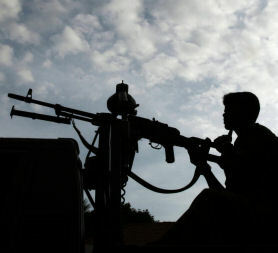 The MPs said that "due to the extremely limited access of international observers to Sri Lanka, it is impossible to be certain how many of those weapons were used subsequently against the civilian population when hostilities began to escalate again in 2006". The group of MPs, made up of members of the defence, foreign affairs, international development and business and enterprise select committees, concluded that the government's policy of assessing licences on a case-by-case basis was "in our opinion, appropriate". But they recommended reviewing all existing licences and urged the government to provide an assessment of what "UK supplied weapons, ammunition, parts and components were used by the Sri Lankan armed forces in the recent military actions against the Tamil Tigers". Labour's Roger Berry, chairman of the committees, said: "Sri Lanka highlights the need for the UK government to monitor closely the situation in countries recently engaged in armed conflict. "It must assess more carefully the risk that UK arms exports might be used by those countries in the future in a way that breaches our licensing criteria." The committee also endorsed the government's policy of a case-by-case assessment of arms exports to Israel but said it was "regrettable" that UK-supplied components were "almost certainly" used during operations in Gaza. The MPs were concerned by the government's decision to shift responsibility for tackling corruption from one Whitehall department to another.